Vintage Detail with Steel Windows & Doors - Kurt Krueger Architects, Inc. 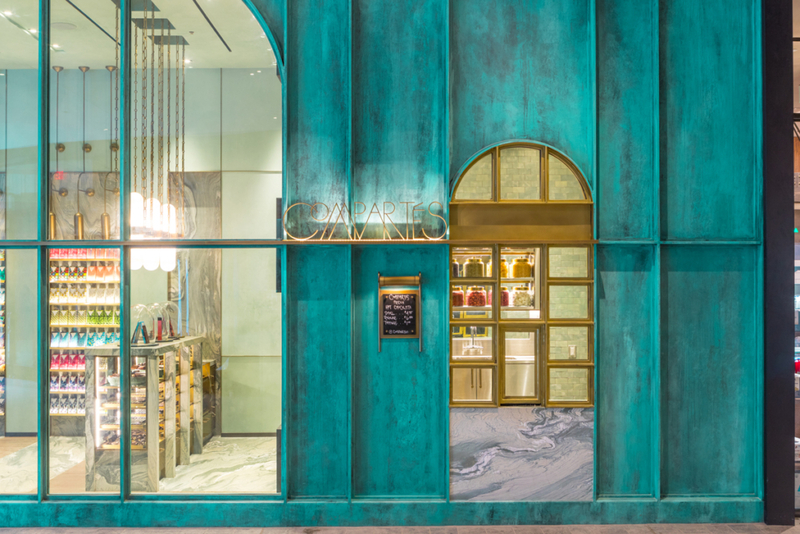 When working on the Compartés flagship store for Los Angeles in collaboration with Kelly Wearstler’s Interior Design Team, we were inspired by old chocolate shops of the early 20th century with their industrial and Art Deco details. We initially looked at using copper for the facade, including for the window framing and doors. 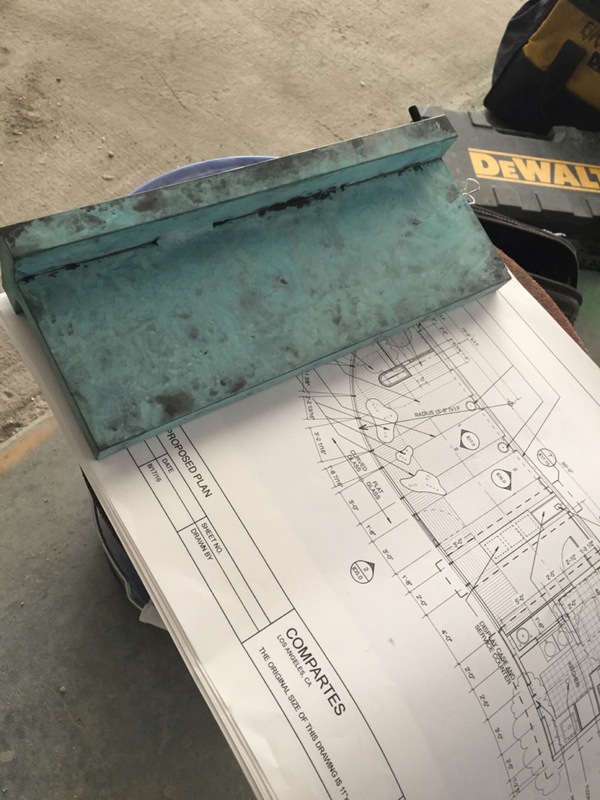 We wanted the exterior to have the emerald green patina that copper takes on over time, but the cost of the material was prohibitive, so we instead decided to use steel. Compartés plans with mockup of patinated steel. You may think of using steel in architectural design as the skeleton structure of the building, but steel has many properties that make it an excellent choice as a finished detail. Steel has the strength and versatility to create extremely thin mullions which allow for the possibility of large, unobstructed views through windows. 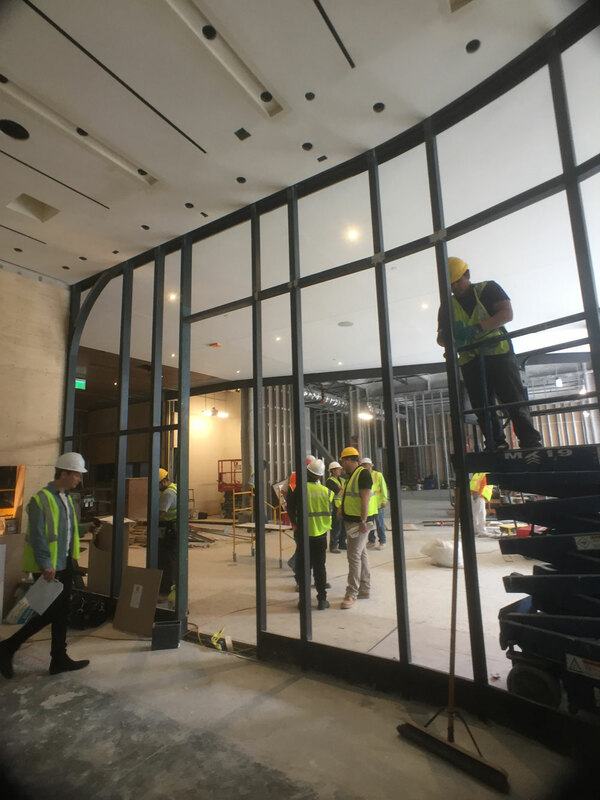 You can design a large window with a simple light pattern and the thin steel is more than strong enough to support the glass and maintain structural integrity. Steel is much stronger than an alternative metal like aluminum and will in many cases outlive the buildings where it is installed. Historically, steel windows are characterized by multiple small panels of glass. They were widely installed across the world, and especially in the Unites States at the start of the 20th century. Using steel in construction has the added benefit of being fire resistant, which was a necessary choice at the time as urban areas began to expand and population density made this a needed consideration. Although the style changed, steel remained a popular choice even during World War II as steel windows were used in many residential housing units due to the limited availability of quality lumber. You may have memories of old school buildings, churches, factories, or meeting houses in your home town that used steel windows. There is something stately and strong about seeing doors and windows made of steel. 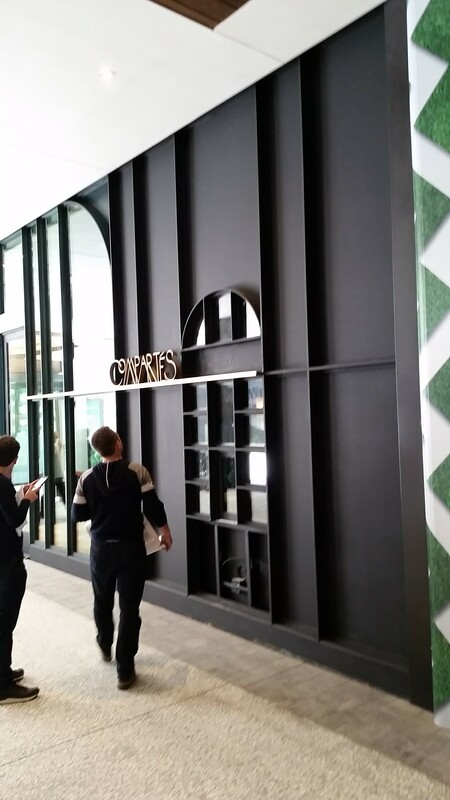 For the Compartés Store, the storefront is a curved glass wall that intersects with a flat panel wall with an inset window. The inset window was designed to create a trompe l’oeil (fooling of the eye). When you are looking at the this vignette, it appears to be a miniature version of the storefront complete with a tiny front door. We used steel for both the windows and the wall. 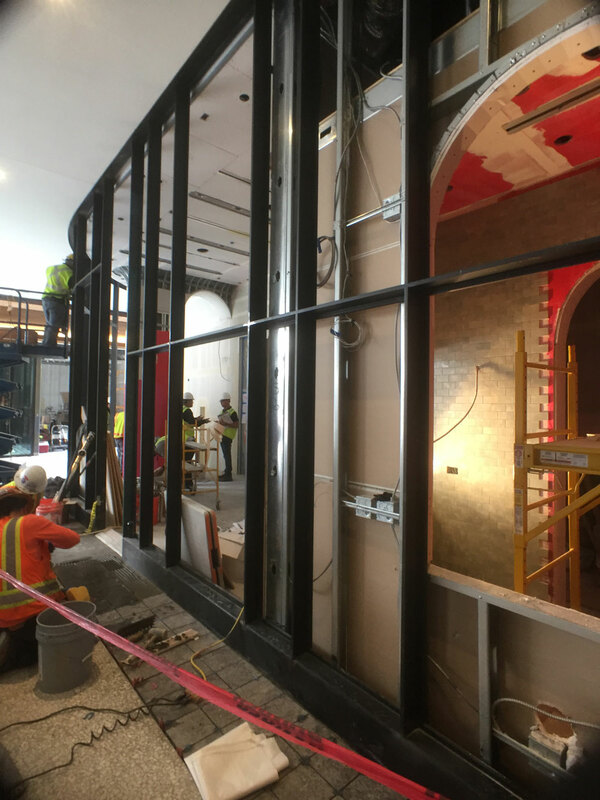 We knew that the thin, vertical mullions could support the large panes of glass as well as the transom windows that were stacked on top of the tall panes (more than 8 feet high). As part of the creative process, we modeled the wall on-site to determine how we could build what we had designed. 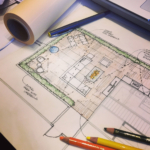 We say this often, but this is one of the key benefits of working with an Architect-Builder like Kurt Krueger Architects: with Kurt leading the design and collaborating directly with the team of craftsmen, we have a unique ability to build complex structures. 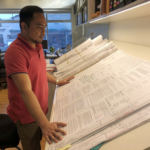 Through careful detailing, complete with full-scale mock-ups made from tube steel and flat bar steel, we were able to come up with a solution that dazzled everyone. Creating the dusky emerald color of the patina was more difficult with steel than copper. Copper naturally changes to this color through a chemical reaction between the material and the air–it’s a pretty simple process–steel does not take on this characteristic naturally. We had to recreate this finish and to ensure an authentic appearance, we conducted multiple product tests among specialty paint options before we hit upon a technique that allowed us to fashion a look that pleased the client and our design team. Steel windows, especially those with a hot-dipped galvanized or cor-ten finish, require minimal maintenance and will sustain their original quality for years to come. Steel is also a ‘green’ product. Because there is an abundance of steel recycled every year (it surpasses the total of paper, aluminum, glass and plastic combined) many steel doors and windows are in fact made from recycled steel. Have you experienced the beauty of steel doors and windows? Ever thought about the strength and loveliness of steel for your home? We’d love to hear your thoughts in the comments below.